HMH Books for Young Readers, 9780547991344, 64pp. "Required reading for serious dinophiles." 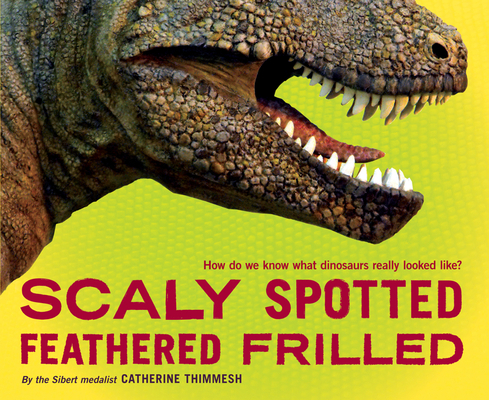 "Readers will come away from this excellent book with a new appreciation for dinosaur imagery and for the talented paleoartists who produce it." "A stellar look at the methods paleoartists employ to bring dinosaurs to life on paper. . . . A terrific package that will draw in browsers and serve report writers while inspiring young artists to consider applying their skills to this enthralling field." "Thimmesh raises good questions, find some intriguing answers, and leaves others for readers to ponder." "This is the kind of information that can lure in readers beyond the usual dino hounds, so casual museumgoers with kids with an interest in forensic reconstructions whould find the topic of interest too."